Make a family plan. Agree on two emergency meeting places for your family: one near your home and one outside of the immediate neighborhood. Decide on an out-of-state contact for everyone in your family to check in with. Give each person an emergency contact card to carry at all times. Also make a plan for any elderly, disabled or handicapped family members. Make disaster kits for your home, car and office. Include a one-week supply of water in your home kit, allowing a gallon per person per day. Include essentials that you can’t survive without, such as prescription medicines and extra eyeglasses. Don’t forget your pets. Strap down your water heater and secure bookcases and cabinets with L-brackets. Learn how to shut off your water and gas valves. Register for the free San Mateo County emergency notification system, which alerts you via cell phone, PDA or computer of emergencies in whichever cities you specify (usually your home and workplace). Go to http://smcalert.info. 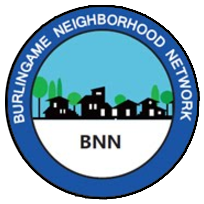 Sign up for the City of Burlingame’s free weekly e-newsletter. During an emergency, the city will send out notifications to subscribers. Make a copy of identify cards and vital documents. Scan them and save them on a flash drive or on a secure cloud application on your computer or mobile device. Store a copy with your out-of-state contact person or in a safe deposit box. Program emergency numbers into your cell phone. Add the 10-digit equivalent of Burlingame’s 911 number: (650) 692-0310. Add ICE (in case of emergency) contacts, too, such as: ICE-Husband, (650) 555-5555. Download and print out the Emergency Info section from the city’s website. Keep it near your phone. For more detailed information on steps you can take to get prepared, visit San Mateo County’s Get Ready site.